I ordered an aluminum Titan from a Chinese supplier and immediately set about modifying it to work better before I ever tried printing with it. There's a huge gap between the feeder tube and the drive gear. I drilled out the hole in the extruder body and added a piece of aluminum tubing to guide the filament all the way from the drive gear to feeder tube. The aluminum tube is epoxied into the extruder body. Is the large black gear aluminium or just the body? Aside from aluminium seeming like a poor choice for a gear like that, those look like ejector pin marks in the second picture. Is the large black gear aluminium or just the body? still plastic. the rest is all metal. A little grease on the motor shaft where the idler sits want hurt things. Edited 1 time(s). Last edit at 06/18/2018 03:46AM by jinx. Even if the extruder turns out to be a bust, the aluminum mounting bracket for the Titan will be a huge improvement over the plastic part you can get from E3D or print yourself. I'll check to see if the original Titan will fit on that aluminum bracket. It doesn't look like they sell the bracket separately. The gear is plastic, and replacement parts are available. I will check to see if the original Titan drive gear fits this extruder. One other problem with this design, or maybe with the part fabrication, is that the filament doesn't ride against the bottom of the concavity in the drive gear teeth, it's a little bit off to one side. That means the filament is going to try to move toward the bottom of the concavity due to the pressure from the pinch roller, which will be fighting against the stiffness of the filament that's trying to push it back up the side. I suspect that will lead to inconsistent extrusion because the diameter of the drive gear increases as the filament moves up the side of the concavity. Since I added the aluminum tube, feeding filament into the extruder is easier- you don't have to hunt for the opening in the feed tube. The tube may prevent the filament from trying to crawl up the side of the drive gear concavity. Edited 1 time(s). Last edit at 06/18/2018 09:57AM by the_digital_dentist. I made a first print with the aluminum Titan today. It seems to work just fine. I checked the fit and found that the E3D Titan drive gear fits perfectly, and the filament gripper teeth line up with the filament path, which means you could buy an aluminum Titan and use the E3D drive gear for it. It also means that one of the big problems with buying Chinese stuff, specifically, the uncertain availability of spare parts, is no concern. I also checked to see if the E3D Titan will fit on the aluminum mount and it does. Blog post with photos and details here. Edited 2 time(s). Last edit at 06/19/2018 12:19PM by the_digital_dentist. can you see if the original titan top fits? what i saw was that my cloned plastic titan had everything offest. this included the hobbed gear as you described, the filiment hole didnt line up with the hobbed gear very well. the hobbed gear was offset and the filiment wouldnt go straight from the hobbed gear to the hole feeder hole. sounds exactly like what you described here. I don't think the plastic front cover will fit on the aluminum Titan because the spring/screw assembly used to push on the pinch roller lever is different. I also bought the "all metal" titan clone a month ago, and have printed with it for the last couple of weeks. However, I have not yet replaced the gear, and have not yet done the same mod as the digital dentist, but I will do it very soon. The biggest problem I experienced was that it squeaked incredibly much. At first I thought it was the plastic gear that rubbed up agenst something, but when I saw that black dust spilled out of it, I realized it was when the shaft of the engine rubbed against the arm of the extruder. I could see that the black surface inside the hole of the arm was worn away, and it was from there that the black dust came from. I have now lubricated it, but I'm considering drilling the hole bigger and inserting a nylon or ptfe tube between the shaft and the hole. I be more tempted to find a stepper with a round shaft rather than D type. had the same dust coming off, all seems fine though with a little grease on that section of the shaft. If the motor shaft has a flat on the surface, the edges are probably sharp, and it's those edges that are chewing up the hole in the pinch roller lever. Use a file or sandpaper to reduce the sharpness. Sometimes I wonder if mechanical engineering is not going backwards, so many basic mistakes that wouldn't be made 30 years ago. Oh yes, but now a simple computer rendering is seen as proof enough of a "design". Edited 3 time(s). Last edit at 07/05/2018 11:57AM by MKSA. That's a good idea. I've done that. I've also given it a little grease, and this evening switched to a new and much better gear. When I'm sitting with the old gear in my hand, I don't think it looks like POM plastic at all. The new gear and my v-wheels seem completely different to touch. 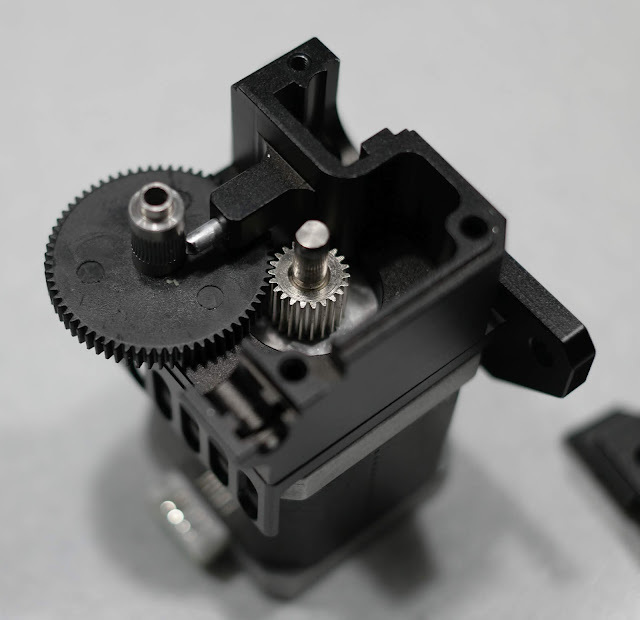 I think the gear that comes with the alu extruder is made of a cheaper plastic type. I wouldn't use any lube except graphite or silicone grease. Petroleum based grease may attack the plastic. E3D was having problems with the grease getting out of their bearings and onto the polycarbonate front cover of the Titan extruder and causing it to crack. But that's the beauty of using an extruder made of aluminum. The only plastic is the big gear, and that is made of POM plastic. POM / acetal will not react with hydrocarbons in the same way as PC. However, it should be mentioned that I have used silicone based lubricant. You are absolutely right, this is a less than optimal solution. But if I had to solve it myself, I would have to machine space for ball bearings in the arm. This is the long-term solution, but will require me to get the arm milled at the local machine workshop. I created my own idler arm to use a groove bearing. For the bushing around the stepper shaft i used 2 M5 brass nuts that I drilled out to be smooth. So far it seems to work well. that looks like a good idea, but cutting into aluminum to install the hexagonal nuts would be a problem. Maybe a brass bushing pressed into a hole would work. Was [www.aliexpress.com] the kind you ordered? AFAICT trianglelab doesn't have an all-metal titan clone, so it's not the OP link. That looks the same as the one I ordered. I had it apart last night so that I could mount it on a new carriage for my printer. I discovered a couple things. 1) the pinch roller bearing had one of its seals come out and jammed up the bearing so it was rotating. 2) the hole in the pinch roller lever that fits over the motor shaft was worn and out of round. There was a considerable amount of black dust (aluminum?) inside the body of the extruder. OTOH, the XCR3D hot-end still looks pretty good. Edited 1 time(s). Last edit at 08/16/2018 07:18AM by the_digital_dentist. The black dust, if it is aluminium, would be the stuff off the surface. The parts didn't look anodized though so I don't know what it's coated with. Is bare aluminium showing through anywhere? Perhaps the flats on the stepper shaft are slowly shaving away at the inside of the hole in the aluminium part. I've always been a bit of a skeptic of using the motor shaft directly as an idler. Even if the edges of the flats aren't sharp I can imagine it slowly scraping/shaving material away from the idler arm like a scraper/plane would. EDIT: I don't know, maybe they are anodized, a bit hard to tell with a black surface in a photo. If they are anodized, isn't aluminium oxide quite tough? I can imagine it getting scratched/gouged maybe but eroded/abraded seems less likely. Edited 1 time(s). Last edit at 08/16/2018 09:49PM by Trakyan. There are no flats on the motor shaft, and whatever the coating on the aluminum is, it doesn't seem to be particularly hard. The black dust is aluminum- bare metal is showing through, and the hole is no longer perfectly round. As pointed out before, a "non sense" and it had to fail that way. Took one full month though. Note their ball bearings are not that great either. A good source of cheap small quality bearings, old hard drive. The picture you posted earlier in the thread shows a flat on the motor shaft (for a grub screw). Out of curiosity, any idea why the aluminium would be making black dust? I'd expect it to make a grey dust, and the black to be from the coating. That being said if the hole is noticeably out of round there must be aluminium in there somewhere. Have you considered drilling out the hole a little and pressing in a brass or copper bushing to ride on the motor shaft instead of the aluminium? Pixel-peeping makes it look like the whole arm is about 12mm across. Perhaps drilling the 5mm hole out to 8mm and using an MR58 bearing would work well. You could 3d-print a jig to drill a straight enough hole if you don't have access to a drill press or a mill. Even better would be milling with an 8mm end mill just deep enough to seat the bearing in the middle of the hole. So if the arm is 8mm thick, milling with an 8mm end mill 2.5mm+(8mm-2.5mm)/2 = 5.25mm deep would leave a 2.75mm flange to seat the bearing against and would seat the bearing right in the middle of the arm thickness (2.75mm flange + 2.5mm bearing thickness + 2.75mm = 8mm). With a drill, I suppose you could drill a little bit at a time and get close enough, test-fitting and measuring until you are satisfied with the fit. yeap and the dust is even nastier, not something I want to be sat near!. took a panther to reveal the problem. you know when its happening with the odd click and faint sound of grinding! Perhaps ... using an MR58 bearing would work well. So, mine arrived today. It was already milled out on the back for an included MR58 bearing around the motor shaft. @the_digital_dentist and @jinx — did yours come with bearings to go around the motor shaft? 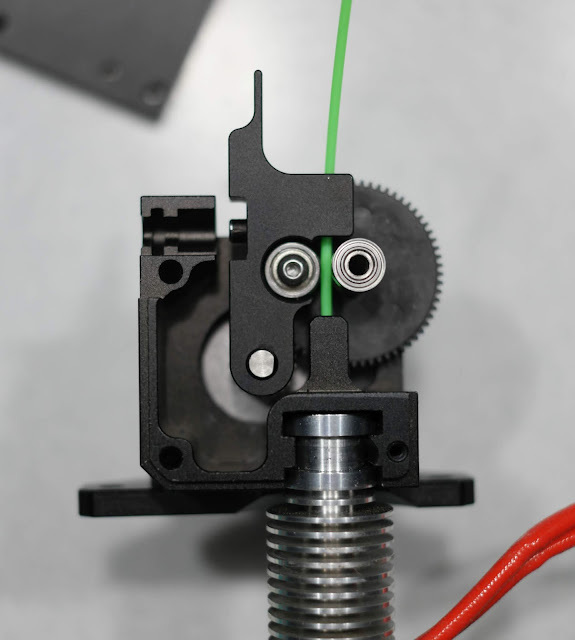 My impression is that the motor shaft bearing being on the back side of the arm and the filament bearing being on the front side of the arm could cause the kind of problem you saw. I'm inclined to mill out the front side of the arm for another bearing, so the arm is supported front and back. The hobbed portion of the axle is still offset (looks like it was manufactured backwards from the original, relative to the face of the POM gear) and it still doesn't properly constrain the filament coming out of the hobbed axle. It was already milled out on the back for an included MR58 bearing around the motor shaft. @the_digital_dentist and @jinx — did yours come with bearings to go around the motor shaft? no thats a new addition, you got a link to that one please.